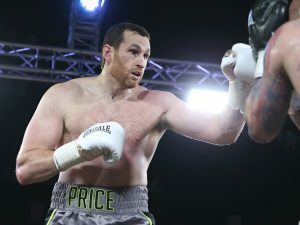 David Price looked good against Kash Ali before a tough Round 5 turned crazy. Photo by Mark Robinson. felix verdejo / ryan garcia. I say “mythical” because it’s a goddamn shame politics are going to get in the way of this one. i know bob and oscar are rehabbing both of their careers but i think this is a really good one under the radar. to possibly be built for the future. That would be fascinating lightweight matchup, and you are correct in assuming that boxing politics are in the way of it happening, but you’re also getting ahead of yourself. Verdejo, who is part of Bob Arum’s Top Rank stable (and is thus showcased on ESPN these days), is the one is being “rehabbed” after suffering his first pro loss last March. Garcia, who is part of De La Hoya’s Golden Boy, which is now aligned with DAZN, is a 20-year-old prospect who is still in the developmental stage of his pro career. However, Garcia says he wants to be moved fast, and he’s even entertaining the idea of fighting for a world title by the end of the year. He is currently the WBO’s No. 1-ranked junior lightweight, but his last three bouts have been at lightweight (and he appears to be a growing young man). 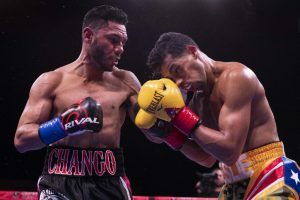 So, if he wants to “get on the board,” so to speak, in the 135-pound ratings of the sanctioning organizations, a victory over a known standout like Verdejo could certainly help him achieve that goal. Would the fighter’s respective promoters let it happen? Probably not. And we’re probably getting ahead of ourselves. Verdejo’s got a tough assignment in Bryan Vasquez on April 20. There’s no guarantee that the popular Puerto Rican wins that fight. And GBP has more players (and possible players) at junior lightweight, so its conceivable that Garcia will be willing to boil his 5-foot-11 body down to 130 pounds for the right opportunity. Although not the biggest fight of the weekend, David Price v Kash Ali was certainly the most controversial. I’d never heard of Ali before this fight, but was told he was a prospect with some bite. The first three rounds were a little toothless from him, despite him jawing a lot with Price during the early exchanges. Then, just as I thought Ali had bitten off more than he could chew, he started to turn things around by finding his appetite for the fight. Now we had a potential scrap on the menu and something for us fans to get our teeth into! In all seriousness, I think Ali found the bright lights too much to stomach and he simply lost his table manners. It’s a shame really because this fight was turning into one fit for a chompionship belt. To pour salt into the wound, Ali was successfully peppering the ribs before the referee jumped in and stopped a potential fan-friendly feast. I think Ali will have to take a serious look at his hunger for boxing moving forward. What he’ll do next, only he knaws best. Your puns were almost as bad as Ali’s boxing form, Matt, but I admit that “chompionship belt” caught me like that right cross Price delivered in Round 5. You can expect Price to stick around as a UK domestic-level gatekeeper. It’s a role he could service well for the next year or two. I thought the veteran looked solid for the first four rounds against Ali. He was controlled and patient with a sharp jab in the opening two rounds, and he looked formidable when he stepped up the pace of the fight in Rounds 3 and 4, pressing Ali to the ropes and working the body of the lesser experienced fighter. I don’t buy Ali’s story that he suddenly reverted to a “street mentality” during his fifth-round tackle of Price. It was evident that Price’s combination punching to the body and head in Rounds 3 and 4 had begun to unravel Ali (more psychologically than physically) before he was rocked in Round 5 and decided to go for the takedown-and-chomp maneuver. Ali was warned for rabbit punches and shoulder bumps prior to Round 5. And yeah, Ali had some success in Round 5 when Price appeared to gas out but he still got clipped by the faded Olympian. Bottom line: Price was too much for Ali. The notion that all he had to do was get past four rounds to overcome Price didn’t sit well with me. Most of Ali’s 15 pro bouts (the first 11, in fact) were four rounders. He’d only been past four rounds once, never past six. And he’d never fought anyone of note. If Price wasn’t the favorite in this matchup, he should have been. Chew on that! for standard rates, i’ll write the weekly preview column & adhere to professional standards of syntax, grammar and rhetoric. or have super fans take turns doing guest column. have montero do it. it’ll be a huge hit. I’ve read it. The WBA gets a lot of deserved criticism from fans and media, but I don’t think anyone (including Team Machado) was as pissed off as you were for the way the sanctioning body treated poor Alberto. Sadly, the moment Machado was knocked out by Cancio, I think most fans recognized Gervonta Davis as the “real” WBA champ. Regarding the prospect of reviving the weekly Weekend Preview column, no offense to you (or any super fans) but I think I’ll give Mr. Montero first dibs. Given the consciousness-raising of the Me Too Movement, how do you interpret Kubrat Pulev’s actions over an unsolicited kiss during a post-fight interview with reporter Jennifer Ravalo? Do you consider his actions out of line or could Pulev’s Eastern European culture have some bearing on this? Personally, I’m glad he has to make an account of his actions. While I’m a long-time fan of boxing, sometimes I have to cringe when my wife and grown daughters chide me for my interest in a sport that involves scantily clad ring card girls. Thanks for your response. Pulev was out of line with that kiss. It would have been out of line way before the “Me-Too” movement. And we can’t dismiss it as a cultural difference. Think about all of the male Eastern European boxers (or athletes and entertainers in general from that part of the world) that have been interviewed by women over the years and decades. How many behaved the way Pulev did? It must have been a slow past two weeks in boxing given that two things that dominated the sport’s news cycles was an unsolicited kiss and a stomach bite during a bout. I’ll be glad when quality matchups are once again the talk of fans and media. Of course, it would help us all move on if Pulev would just do what Kash Ali did after his bite incident: admit he was wrong. Ali told iFL TV that he was “disappointed” in himself, “out of order” and that there was “no excuses” for his behavior. Pulev should do the same.